Something that no one can disagree is the fact that India has a rich heritage that beautifully seeps into the foods that we’ve always been proud about. Our culture and tradition, though different in each corner of the country, has its roots connected with a few major customs in which food play a pivotal role. But in the world of modernisation, we’re rarely lucky enough to spot eatables dished out the traditional way our ancestors used to enjoy. Not to mention the fact that each place is famous for something and finding a shop that gives us a taste of everything that our country as a whole has to offer sounds like a miracle. But guess what? Miracles do happen. Place of Origin is a website that does exactly what the name says, delivering the long lost, forgotten treasures that our grannies and granddads cherished. Their objective is to bring online all those special foods that we crave the most and that are difficult to find locally. 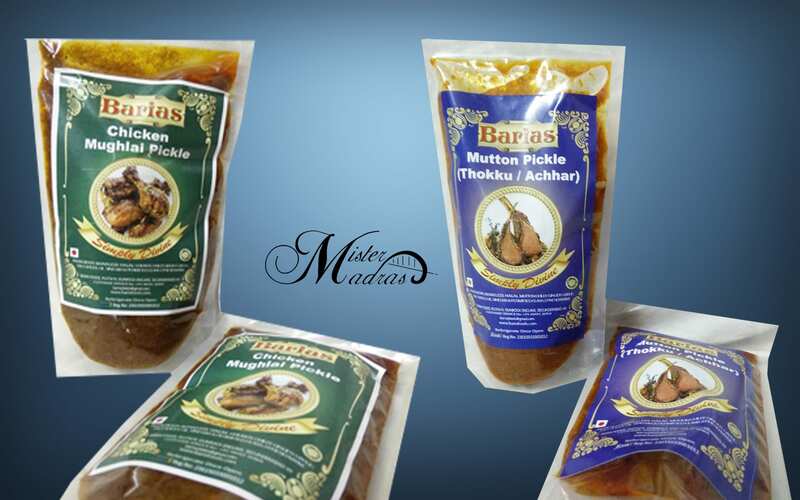 In their site, they offer the finest sweets, snacks, dry fruits, namkeen, pickle, jams, tea, coffee and staples from all over India. They supply from 100 brands, sourced from 23 Indian states and delivery facilities that covers almost the whole of the Indian subcontinent. From Gujarat snacks to Darjeeling`s Green tea, Coorg coffee to Pachranga pickles, Mumbai Dry Fruits to Ooty chocolate, Kashmiri Saffron to Ratnagiri mango, they deliver India’s favourite foods direct from the original producer to our doorstep. Check them out here. Personally, I feel they have one of the most user friendly, uncluttered shopping sites I’ve come across in recent times. I got to try a pair of their famous Barias pickles and this post will be on them. It’s a well known fact that pickles are a staple in any South Indian meal. For meat lovers, nothing can be a better side dish than a non veg pickle. For that namesake portion of curd rice at the end of a meal, the main side if there’s nothing but plain rice left at home or even if there’s nothing but good ol’ bread in sight, this is the dish that would save you from hunger. Being a carnivore, even the veggie-st of meals for me would be much more special with a pinch of something non veg in it. When my recent non veg pickle got over, which was a mess, thanks to the amount of oil it had and not to mention the ‘traces’ of meat pieces, I was actually on the verge of telling my mom to try non veg pickles, considering she’s a pro when it comes to veggie ones. That’s when I got my hands on Barias and I can now safely say something for sure. My mom doesn’t have to go through the trouble of making them. Who would’ve thought chicken pickles can be so delicious. Chicken is one of those meats that doesn’t really soak in the flavours of whatever gravy it’s used in. Marinating it for hours is a trick that I use when it comes to making kebabs or chicken 65 when I don the apron (which does happen occasionally). 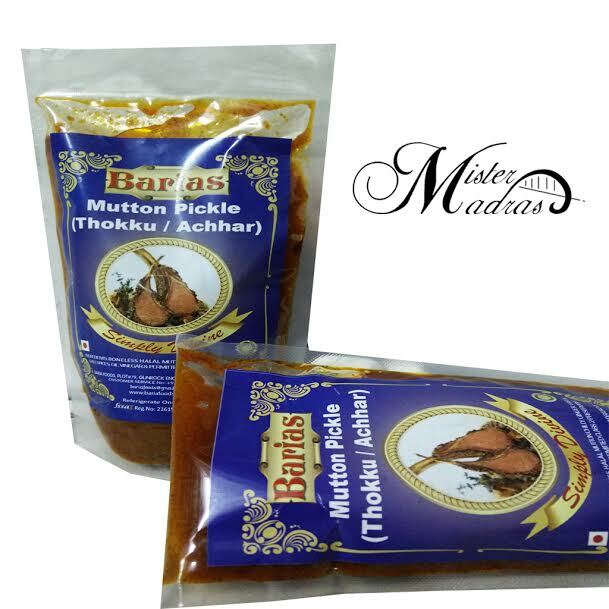 The Chicken Mughlai Pickle I got my hands on is made by Barias. This pickle is made with lean boneless chicken and the pieces were sized perfectly as bite sized chunks. According to their website, the other ingredients include garlic, garam masala, green chillies, ginger, coriander powder, cumin, yogurt, tomatoes all blended together to make a curry. This has a splendid, rich flavor of spices that is unique and has a mouth watering taste that left me wanting for more. The Chicken Mughlai Pickle will go well with any vegetarian main dish or one can savour this pickle with a roti or plain rice and dal. This pickle is sold as set of 2 packets which weighs together as 500gms. They’re priced at Rs. 390 per set. Marinated red meats in curry is a delicacy across the planet and if it’s beef/pork for those in Goa and abroad, it’s mutton for those down in the south. Thokku is something that’s not completely a pickle. It can be compared to that of a relish. While in Tamilnadu, what we’re accustomed to are fish thokku at the best when it comes to non veg, here’s an Andra-ish take on mutton thokku. The Mutton Andhra Thokku is, as expected from any pickle that’s coming out of Andhra/Telengana, is fiery hot. This pickle paste is made like a curry masala with ginger, garlic, chillies, curry leaves, onions, tomatoes and a melange of spices including cardamom, cumin, bayleaf etc and chunky pieces of lean boneless mutton. The ‘kick’ one gets from biting into a mutton piece is nothing short of a foodgasm. The curry flavour has seeped in perfectly and the meat is well marinated by absorbing the flavours. The rich red chilly and whole garlic pods add that extra zest and zing. It’s this which actually makes me crave for more of it. A spoonful of this thokku would make a cup of warm curd rice look even more divine and if that’s not available, make it two spoonfuls and mix it with plain rice to get a taste of Andhra mutton curry. This pickle too is sold as set of 2 packets which weighs together as 500gms. They’re priced at Rs. 450 per set. 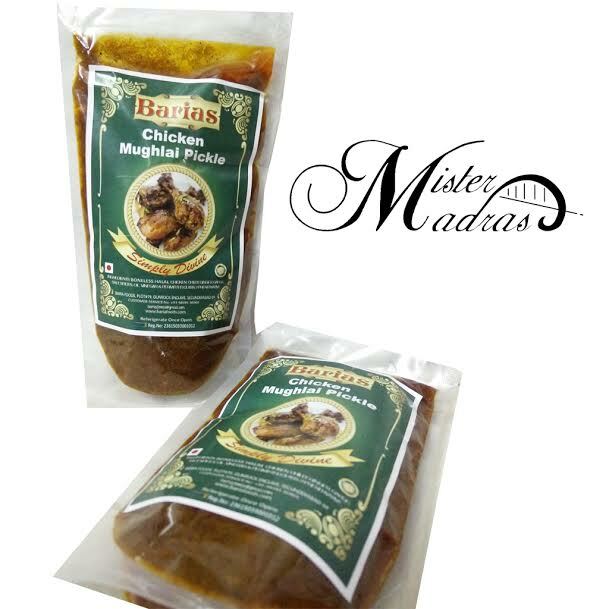 As far as Barias Pickles are concerned, all the meat they use are halal and boneless. Something that I figured out the moment I opened a packet was that the meat to masala ratio is perfect in these pickles. In other words, they amount of meat packed in a packet is surprisingly higher than what I’m used to with the local brands. The website also ensures that the products are made fresh and then packaged, thereby ensuring we get max days of shelf life in our hand. The pickles for example, come with one entire year’s shelf life. When getting food products delivered, especially something as complex as pickles (considering how preservation is important for pickles), I was pleasantly taken aback when I got the packets placed neatly in sturdy cardboard boxes. The website also promises that the order would reach our doorsteps from anywhere between 5 days to a week from the day of ordering. With perfect taste, sufficient meat and bang-for-the-buck pricing, my days of experimenting with new brands of non-veg pickles are officially over. I can’t wait to finish these two packets so I can buy and try my all time favourite Prawn Pickles. If that wasn’t enough, Place Of Origin also has Shredded Pork Pickle, Shredded Beef Pickle and Fish Pickle with dry Bamboo shoots. With so many options, I must say, I’m clueless on what to pick(le).